By Joni Kamiya. 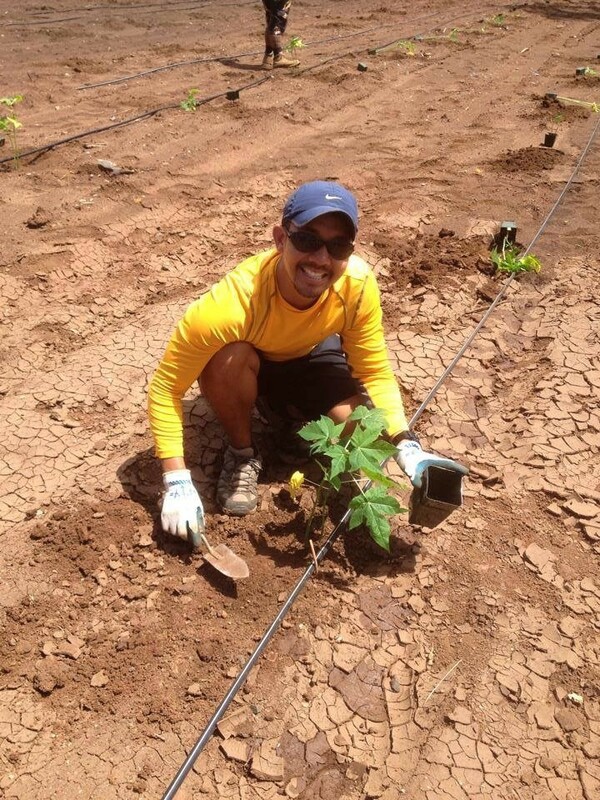 Joni Kamiya is an occupational therapist by training and an “ag-vocate” in Hawaii on many science issues. She is a wife, mother of three and the daughter of long-time papaya farmer and former Hawaii Papaya Industry Association president, Kenneth Kamiya. As part of GMO Answers’ GPS on GMOs series, GMO Answers is highlighting some of science and agriculture’s revolutionary female leaders and their research in specific parts of the world. The following post is the second installment of this series and highlights Joni Kamiya, who shares how biotechnology saved her family’s papaya farm. If you ever go to a farmer’s market here in Hawaii, one of the main staples sold are papayas. 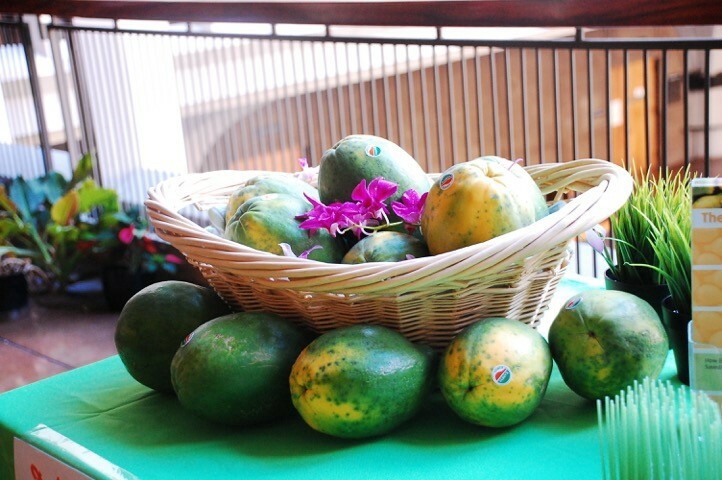 People here love their papayas and have done so since they were first introduced and developed back in the 1950’s at the University of Hawaii at Manoa (UH). As many local people have discovered, papaya helps in digestion and regularity as well as provide vitamin C.
Today, the local people can still enjoy the papayas here thanks to biotechnology. 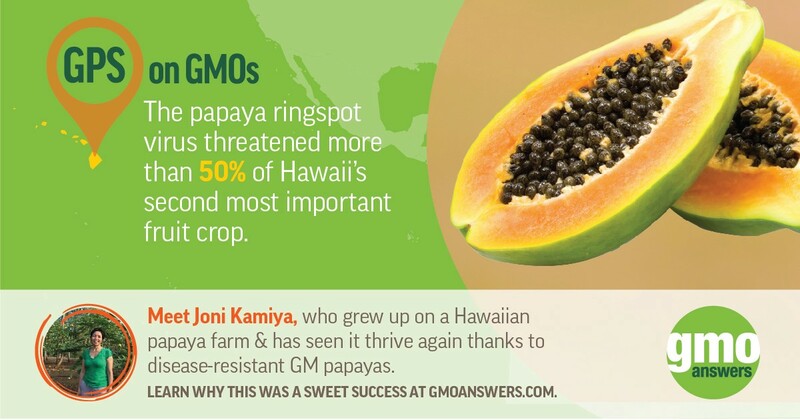 The papaya ringspot virus (PRSV) has been ever present in our islands for nearly 100 years, and farmers have learned to escape it for decades until about the 1980’s. The virus-infected trees were controlled by cutting them down to decrease the vector source, and no spray prevented this disease, which was spread by aphids. Despite many attempts to move farms to other areas, the virus made its way across the state, devastating the industry. It left fruits inedible and trees unable to produce fruits due to misshapen leaves that could no longer photosynthesize. Thanks to science, research was working on solving the problem of PRSV for many decades. Initially, the concept was inoculating plants with a similar virus, or a mild cucurbit one, that was similar to PRSV. This technique was called cross protection. Field trials were conducted on these trees; however, with an actual virus inserted into the genome of the plant, the production of papayas were dependent upon the viral load, and the quality was affected also. It was later discovered that by taking the mild form of the virus, similar to an inoculation and inserting it into the papaya genome, the plant produced more consistent fruit and didn’t vary tremendously with weather and seasons. The quality remained consistent, which is what farmers and consumers wanted. That was the beginning of the GM papaya story here in Hawaii for our family farm. This technology helped to sustain our family farm that was started with my grandfather. My grandfather was a farmer of cucumbers, beans, bananas, hogs, and dairy. These crops weren’t always producing well, and when my dad returned from the Air Force, he went to the farm and wanted a crop that could produce income all year round. Papayas were the crop of choice. He worked closely with the UH plant breeders to develop his own variety known as Kamiya papaya. My dad’s goal for farming was to grow a high quality fruit that people wanted and, sure enough, he created his fan club. My dad was able to farm for some two decades before the ringspot virus started to create a slow death of his farm. He knew that technology could offer hope for continuing his farm and, as a result, he was an early adopter of it. His customers wanted the papayas again and continually checked in to see when it would happen. By the late 1990’s, GM papayas were being grown and consumers started buying it again. When my brother was between careers, he decided that he wanted to take on the farm. The technology that saved our farm helped keep it going to make it a third-generation farm. Farmers and their families want technology because it will keep them farming for years to come and consumers get to have their regular papayas for decades.